HARMAN’s Martin Professional announces the availability of the RUSH Gobo Projector 1™, part of Martin’s comprehensive offering of new lighting fixtures on display at Integrated Systems Europe (ISE) 2015 February 10-12. The new member of the install-oriented RUSH family will be shipping at the end of February and on display at ISE at HARMAN’s stand #1-F6. 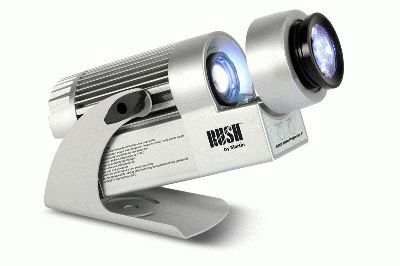 The RUSH Gobo Projector 1™ is ideal for permanent installation in club, bar, restaurant and shopping mall applications. Gobos can be changed quickly easy adjustment of focus, speed and direction make running the static fixture smooth and intuitive. It’s also non-intrusive thanks to its silent operation and compact size, measuring 215 x 135 x 152 mm and weighing only 11 lbs. (2 kg). The fixture uses E30-sized gobos with a maximum image diameter of 30 mm and thickness of 4 mm. Its light source is a 20 W LED array and projects a 17 degree beam angle with an estimated minimum LED lifetime of 30,000 hours. The unit is cased in silver and possesses an IP20 protection rating for indoor mounting with an included adjustable bracket.